Lori Faye Bock was born in Detroit and credits supportive parents, the Detroit Institute of Arts and a scholarship to the Center for Creative Studies College of Art & Design (where she studied ceramics) for her pursuit of a career in art. Later she attended and graduated from Western Michigan University with a B.S. in elementary education and went on to teach in the Los Angeles Unified School District. 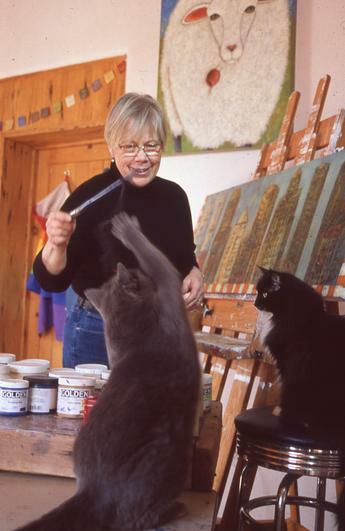 In the late eighties, Bock moved to Santa Fe, New Mexico and opened a studio/gallery on Gypsy Alley, an artists’ haven just off historic Canyon Road where she created & showcased her clay work. Longing for life beyond the sidewalk, she and her husband purchased an abandoned adobe farmhouse, the origins of which date back to 1734. There, in the agricultural community of Los Silvestres just north of the tiny village of Abiquiu, they proceeded to acquire their bevy of companion pets and farm animals. In 1994, they founded the Abiquiu Studio Tour – a weekend venue for local artists in early October. focus on surface decoration creating whimsical endearing companions, Bock began painting her images on paper, wood panel and canvas, continuing to portray her beloved animals. Already successful as a ceramicist, she found a ready acceptance for her paintings among collectors. Her images are known nationally and have been used by PetSmart Charities, the ASPCA, and the American Humane for campaigns to raise the consciousness for the humane and kind treatment of animals as well as microchip, tattoo, and traditional tagging of all dogs and cats. Lori Faye Bock¹s work has the whimsy of a Klee and the color and detail of a Matisse. Her paintings deftly capture the essence of their subjects with a dash of irony, humor and often, poignancy. Her reward comes, she says, when the joy she feels in portraying her animal subjects is communicated to those who see her paintings. My fascination with nature, particularly birds, continues to be a great inspiration and focus in my current body of work. In addition, animals, both domestic and farm, and windowscapes, incorporating interiors and exteriors comprise my painting repertoire. The birds, animals and windowscapes are the result of my joyful experiences, observations and interpretations of life here on the farm in the beautiful river valley in northern New Mexico where I have lived for nearly three decades. My painting process begins with multiple layers of gesso and venetian plaster applied with palette knives resulting in variegated textures followed by intricate details using acrylic paint on cradled Baltic birch. I find the juxtaposition of fine brushwork against a sea of chance exciting and is propelling me into further exploration. I am more and more enjoying the inherent characteristics of paint. The farther along I travel in a painting the more I fall in love with the experience. The more intricately detailed I become, the more I sense there is life staring back at me. This sense of life, with all its meaningfulness, playfulness, beauty and joy, is what I hope my viewers will experience as well.